Usually, I write decently lengthy introductions about each club. But today, I’m going to cut to the chase about Marquee Las Vegas. This club throws the best party in Vegas hands down, especially on Monday night. And, if you want the biggest bang for your buck, Marquee is it. You’ll see fantastic DJs with unique EDM sets and top-rated hip-hop artists at excellent bottle service prices. Now there’s a lot more to tell you about, and I’ll get into it in just a second. But for now, I want you to know that we’re here to help you. If you have questions about any Vegas club, please contact us. We’re happy to assist. For Marquee bottle service price quotes, please text us at (702) 816-6738. You can also email us at info@vegasprimer.com. You know your night is going to be phenomenal when you’re partying at a top Vegas hotel. 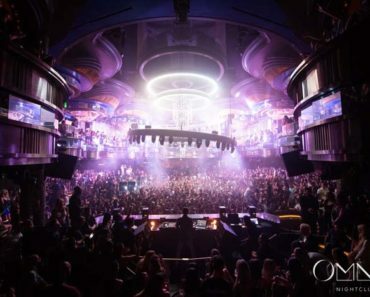 But even if Marquee Las Vegas wasn’t inside The Cosmopolitan, Marquee Nightclub would stand on its own as it has one of the best outdoor clubbing experiences in town. In fact, it’s the only venue I make a beeline to the outside area the second I arrive. It’s just got a cool LA vibe with its intimate setting and low-level lights. Frankly, it almost makes you forget you’re on the strip. But if you do happen to look out beyond the club, you’ll see one of the most beautiful views of Las Vegas Blvd. Inside, you’ll find the club to have a more European type feel. It’s dark and moody with a heavy focus on music. You’ll get a nice mix of EDM and hip-hop here too. If you’re big into music, you’ll instantly recognize the DJ talent. But, if you’re more of a casual listener, you probably won’t have a clue. And that’s not necessarily a bad thing either. At times, the powerhouse DJs (like Calvin and Tiesto) have repetitive sets which can get a little annoying. But, at Marquee, that’s not the case. You’ll get lots of variety with fresh and unique mixes. Definitely, no cookie cutter DJ sets here. On the other hand, the artist and rapper talent is a different story. Marquee has some of the most notable hip-hop talent including Travis Scott and French Montana. Where Is Marquee Las Vegas located? You’ll find Marquee Las Vegas inside the Cosmopolitan hotel at 3708 S Las Vegas Blvd. If you’re getting dropped off at the Main Valet, walk past the first set of escalators. Keep walking until you see the Chandelier bar (you can’t miss it – it’s two million crystals of pink light spanning three floors). From here, take the escalators up to the second floor. Turn right off the elevator and then right again. The entrance to Marquee will be in front of you. The dress code at Marquee Nightclub is similar to all nightclubs in Vegas with one exception: no t-shirts. The Tao Group owns Marquee, and they are vehemently opposed to anyone wearing a t-shirt. It’s best not even to try it. Dress up, and you’ll get in just fine. For guys, a button-up shirt with pants (jeans are okay) and dress shoes is the outfit of choice. Please remember no hats, sneakers, or clothing with sports teams. For ladies, a dress and heels are recommended. You can also get away with jeans and a top. My advice is that you can wear just about anything as long as your shoes look nice. If you don’t want bottle service and you’re a guy (either by yourself or in an all-guy group), then buying tickets is your best option (it’s also your only option). And, purchasing tickets online, in advance, will get you the best deal as ticket prices are usually higher at the door. You can get your tickets from the Marquee website here. Tickets are also a good option for ladies if you’re not on the guest list (or if you’re past the Marquee guest list cut-off time of midnight). $20 for ladies and $30-$40 for guys depending on the night. Please note that these are presale prices. Like I just mentioned, the cost may go up at the door. If you need Marquee bottle service reservations, please text us at (702) 816-6738. You can also reach us via email at info@vegasprimer.com. We’re happy to help answer any questions about Marquee. Marquee Nightclub offers a guest list every Monday, Friday, and Saturday night. If you’re on the list, you get free entry into the club. Here’s who can get on Marquee’s guest list. Please note that if it’s a performance night, there may not be a guest list. How Do I Get On Marquee’s Guest List? If you meet the above criteria, text us at (702) 816-6738 to get on Marquee’s guest list. You can also email us at info@vegasprimer.com. Please include your first and last name, the number of people in your party, and the ratio of women to men. Please note: There are a few times during the year when Marquee’s guest list isn’t open. For example, closures occur on big holidays like New Year’s Eve or sometimes during the three day weekends. We recommend booking bottle service or buying tickets during these times instead. For some reason, people seem to sleep on Marquee. They’re so focused on XS or Omnia that they overlook this club entirely. And the funny thing is they might have a better time at Marquee because their money will go a lot further. For instance, you can get a dance floor table for THOUSANDS less than at XS or Omnia. And, because Marquee attracts a good size crowd and brings in some excellent DJs, it’s our top pick for best bang for your buck clubs. 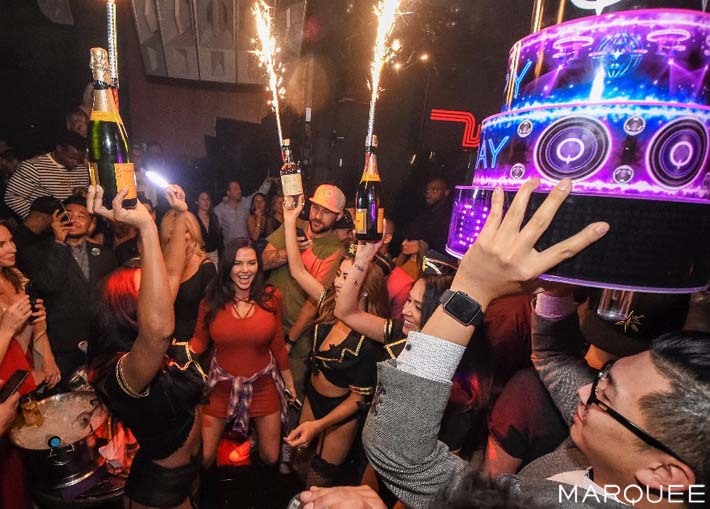 How Much Is Bottle Service At Marquee Las Vegas? In general, pricing for Marquee Las Vegas table service is as follows. Please note that prices are subject to change and may be higher on holiday or event weekends. If you’re interested in finding out more about Marquee’s bottle service, you can reach us at (702) 816-6738 or info@vegasprimer.com. Often, Marquee bottle service prices are quoted regarding a minimum spend requirement only. Just like in our pricing example above, each table type has a minimum you must meet. For instance, if you book a back wall table with a $1,100 minimum then you’ll need to spend at least $1,100 on alcohol. However, it’s important to know that the minimum is not the final price you’ll pay. All day and nightclubs in Las Vegas charge additional fees on top of the minimum: service fee, tax, and tip. These other charges add up to approximately 35%. You can use this percentage at all clubs to get a close estimate of the final bottle service price. The good news here is that the tip is already included so even if the club shows a separate line for a tip on the receipt you can leave it blank. (Unless, of course, you’re feeling extra generous and want to go above and beyond.) Here’s how to calculate the total bottle service cost. $1,485 is the total price you’ll pay (assuming you don’t go over your minimum spend of $1,100). 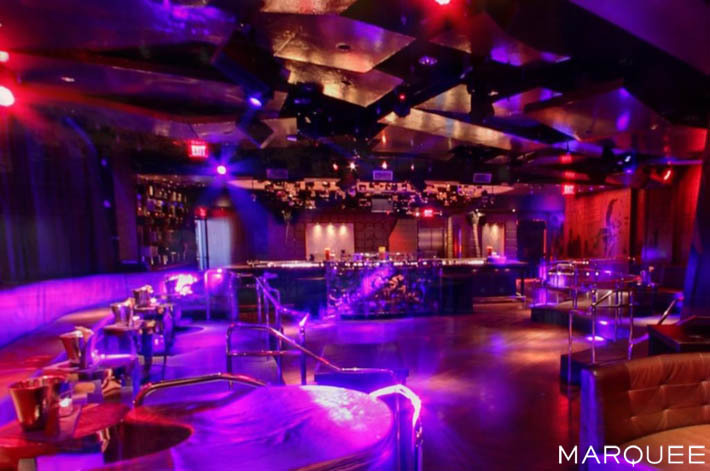 Making a bottle service reservation at Marquee Las Vegas gets you a lot of perks. You’ll enjoy expedited entry through the VIP line, no cover charge, a personal cocktail waitress, security team, busser, and unlimited mixers (like juices) and garnishes at your table. If bottle service is within your budget, there’s no better way to enjoy a Las Vegas club. Are there Marquee promo codes or discounts on bottle service? There aren’t any promo codes in the conventional sense, but having a well-connected VIP host can get you a better table location at the door. There’s also a chance of a lower minimum for a prime table location. At times, Marquee offers discounts on individual bottles too. For example, you may save a few hundred dollars if you select a promotional bottle for your table. Call or text us at (702) 816-6738 to find out if there are any specials on your night. Below you’ll find the floor plan for Marquee Nightclub. The map shows the table locations inside Marquee’s Main Room, Cloud Room, and Salon. Please note that table numbers are subject to change. And, although we’re showing specific table numbers here, Marquee doesn’t guarantee individual tables with reservations, only sections. So, for example, if you reserve a Dance Floor Table, then expect a table in the 50s or 60s. If you absolutely must have a specific table number, a request can be made, but it may require an increased minimum or full pre-payment. If you’re interested in an Outdoor Patio Table or Cabana, the tables are located just outside of the Cloud Room. You can still hear the Main Room DJ from here, and you’ll have access to the Cloud Bar as well as Marquee’s bar outside. 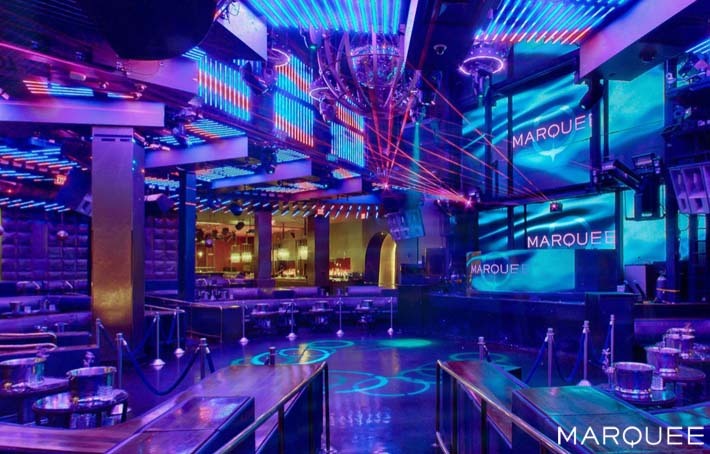 The best table locations at Marquee Nightclub are any of the Dance Floor Tables. These are tables in the 50s and 60s. Dance Floor Tables offer the best view of the DJ since they’re closest to the DJ booth. They’re also closest to the action as the tables are right on the dance floor. Dance Floor Tables command the highest prices in the club. Expect bottle service pricing to be around $2,500 – $3,500. Quite frankly, this is a steal compared to Omnia or XS’s Dance Floor Tables which on some nights are as high as $10,000 or more. If you’re looking for the best combination of price and table location, then you’ll appreciate our picks for best value tables. Tables in the 30s and 40s (also called Elevated Dance Floor Tables) are a great deal. With these tables, you’ve got some of the best seats in the house, directly behind the Dance Floor Tables. And, you’ll save a lot as compared to the Dance Floor Tables. For example, on an upcoming March night, Dance Floor Tables are $3,500, but the Elevated Dance Floor Tables go for only $2,000. That’s a savings of $1,500 for just a few feet difference. We’re also big fans of the Back Wall Tables. In fact, anytime I do bottle service at Marquee I opt for these tables. Refer to table numbers 21 – 26, 70, and the 80s and 90s on the map. My personal favorites are tables 21 – 26. I don’t know if I’d say there are “bad” table locations at Marquee. It depends on what type of environment you want. For instance, if you’d like to be in the action near the DJ, then I’d steer clear of the Salon, Cloud Room and Outside Patio. If you want bargain bottle service, look no further than tables in the Outside Patio or Cloud Room. Patio Tables start at $550 and Cloud Room Tables at $1,000. Although the Cloud Room Tables aren’t technically in the Main Room, you can still see the DJ booth, and you’ll have a dance floor between the Cloud Bar and your table. It also has immediate access to the outside area. Also, on nights when Marquee’s hip-hop rooms are open (the Boom Box Room and The Library) you can get deals on bottle service. The Boom Box Room is open on select evenings throughout the year. Prices usually start at $550 in here. The Library, on the other hand, is rarely, if ever, open. But, if it happens to be open, it’s worth checking out. It’s such a different vibe than any other club in Las Vegas. 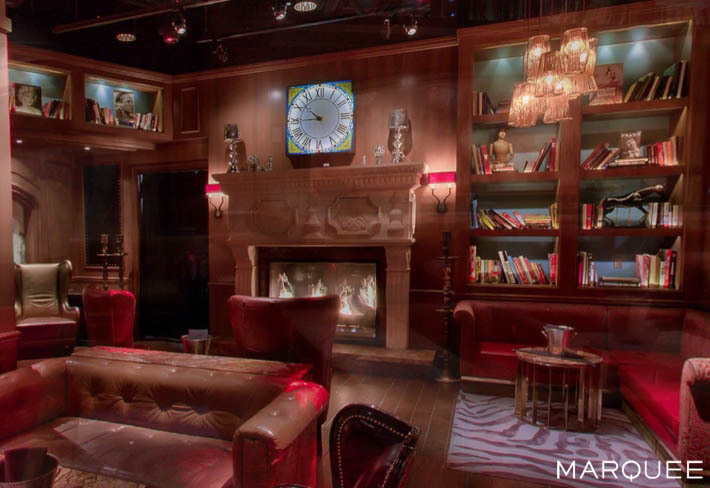 With its bookcases lining the walls, a real working fireplace and a pool table it’s easy to see why it’s named “The Library.” This club is right for you if you want a clubbing spot that’s more chill. Is it just me or does The Library remind anyone else of the board game “Clue”? Below is Marquee’s bottle menu. Please note that this menu is for informational purposes only. Although it’s the most current menu, prices and offerings are subject to change without notice. With certain bottle purchases, Marquee will make a display when bringing your bottle to the table. Examples of bottle presentations include sparklers, LED lights, your name spelled out with signs or white flags guaranteed to draw all eyes to you. There are even lighted birthday cakes and giant cupcakes. And, of course, multiple cocktail waitresses surrounding you. Marquee’s presentations aren’t as over the top like some of the other clubs in Vegas, but they’re still excellent. And the cool thing about Marquee is that the waitresses can drink with you. We’re all for this because it makes it feel more like a full-on party when the staff is participating in the fun too. Another way to get a bottle presentation is to agree to a higher minimum spend. $2,000 or more should land you one. Depending on how busy the club is on any given night, Marquee may have promoter tables or girl comp tables available. Let me take a moment to explain what a promoter is. A Marquee promoter is employed directly by the club. Their primary job responsibility is to get people to Marquee, especially women. And the more women a club has, the more the men will come. And the more men that are at the club, the more money that gets spent. So, you can see how essential ladies are to a nightclub, and why a promoter’s role is so vital. Promoter tables are great because you can get a considerable amount of bottles at these tables too and, even better, you don’t have to tip. They’re perfect if you just want to hang out with the promoter and your friends and enjoy the night. Keep in mind though that you will most likely be at the table with other groups of women. And, the table may not last all night if it gets too busy or all the tables sell out. If a Marquee promoter table is something you’re interested in, call or text us at (702) 816-6738. Marquee also offers girl comp tables. If you have a big enough group, you might land a complimentary table for your entire party. But even if you have a smaller party, Marquee may pair you up with another group of girls to share a table. Similar to promoter tables, girl comp tables usually don’t last all night, but you can most likely count on at least an hour or two at Marquee. With girl comp tables though, you’ll need to tip the waitress. $100 per bottle is customary. So, if you have a group of five women, it would work out to be $20 per person per bottle. If you’d like to find out more information about Marquee girl comp tables, call or text us at (702) 816-6738. Yes, it’s true. If you’re a woman and you’re on Marquee’s guest list, you’ll want to head to the third floor. Right next to the Beauty & Essex restaurant is a complimentary champagne table. Just look for the carpeted area with seating and a cocktail waitress in a dress. You can’t miss it. She’ll be handing out free champagne to the ladies before the club opens. We recommend arriving around 10 pm to take full advantage of this freebie. And, sorry gents, this is only for the ladies. As a side note, if you’re looking for an excellent dinner spot before heading to Marquee, we highly recommend Beauty & Essex. In fact, it’s one of our favorite restaurants in all of Vegas because the food is so exceptional. A word of caution though, if you’re looking for an intimate, quiet setting this is not the restaurant for you. It can get really loud because of it’s smaller size and concrete flooring. There may even be times when you have to shout to talk. If you’d like to make a reservation here, plan on booking it as soon as possible (even a month out is advised). And if you want to come here before your night out at Marquee, we recommend making a reservation around 8:30 pm. Sometimes, even if you have a reservation, there may be a wait. The servers at Marquee Las Vegas are some of the nicest in town. At a lot of clubs, you may notice that the waitresses are a bit standoffish. That’s not the case at Marquee. They’re friendly and will talk with you. And as I touched on before, when you order specialty bottles, they can drink with you. The Electric Daisy Carnival (EDC) takes place around May or June each year in Las Vegas. It’s one of the biggest festivals ever created featuring electronic dance music. And, it’s such a big event that Marquee celebrates with a “Halfway to EDC” weekend in January or February. Halfway to EDC is like a mini festival with special DJs from EDC performing. It takes place inside Marquee’s Dayclub, under their climate-controlled dome. (It’s a balmy 80 degrees even in the winter.) The event has happened every year for the past five years, but for some reason this year (2018) it didn’t. Hopefully, next year Marquee will bring it back. Marquee is one of the only clubs that has hotel rooms connected to the nightclub itself. These “bungalow suites” offer the ultimate party experience with direct access to Marquee through their outdoor patios. They’re best described as immaculate townhomes spanning three stories with multiple bedrooms and living areas, balconies and rooftop hot tubs (not to mention the enormous bathrooms and showers). You can even get bottle service in your room. But the best part about these suites is when you’re ready to head to the club, just exit out the back of your suite to the club. You’ll immediately be inside Marquee’s outdoor pool area. Just don’t forget to say hi to your private security guard, he guards all the suites to make sure no unwanted guests enter. Prices for a night in a bungalow suite will set you back a few grand. On Mondays, Marquee has one of the best industry night parties on the strip. In fact, if you’re looking for a club on Monday night, Marquee throws an epic party. They also have some cool events on Mondays. For example, this past March, Marquee hosted their first-ever Industry School Night party, Sadie Hawkins style. It’s a girl ask guy event with the best matching couple winning a getaway to Los Angeles. To read more about industry nights in Vegas, check out our article here. 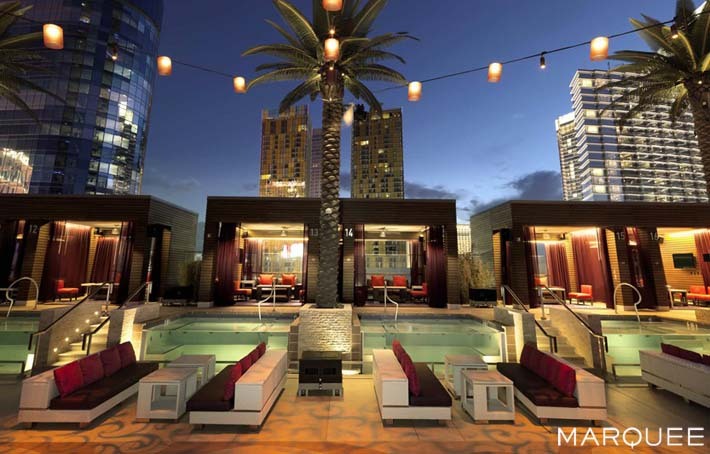 During the summer months, Marquee has a daytime pool party. Open from 11 am until dusk, you’ll find a lot of the same DJs at the dayclub as you will in the nightclub. Marquee’s dayclub is one of the most packed on the strip. In fact, we’d rank it #4 (behind Encore Beach Club (EBC), Wet Republic and Rehab Beach Club). For more information or to book a VIP experience at Marquee Dayclub, contact us at (702) 816-6738. 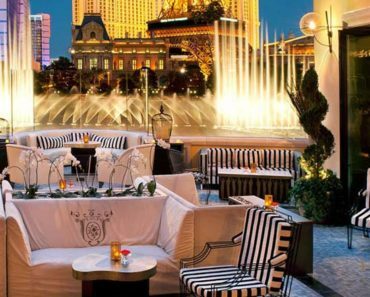 And, that completes our Ultimate Guide to Marquee Las Vegas. Did we leave anything out? Let us know in the comments. And if you have any questions about Marquee, please feel free to contact us either by filling out the form below or by calling us at (702) 816-6738. P.S. If you liked this guide, check out our article on XS Las Vegas here.